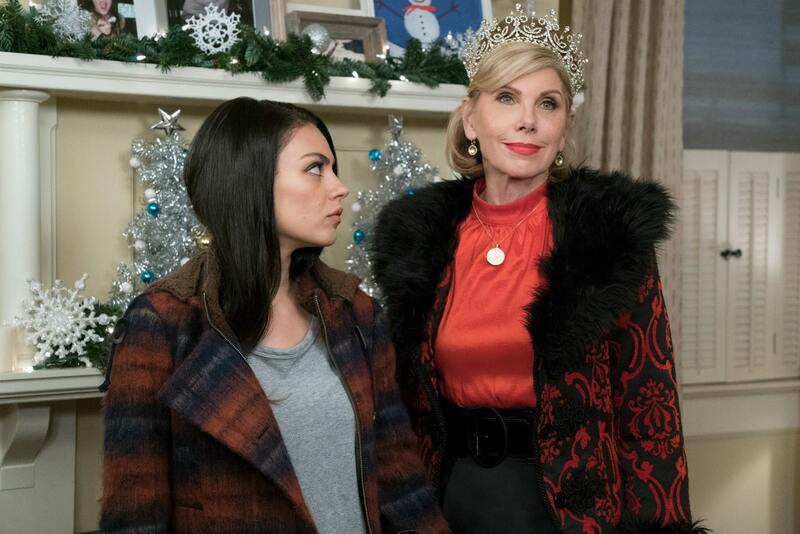 Everyone’s favorite Bad Moms are back and this time they are sharing the big screen with their moms! 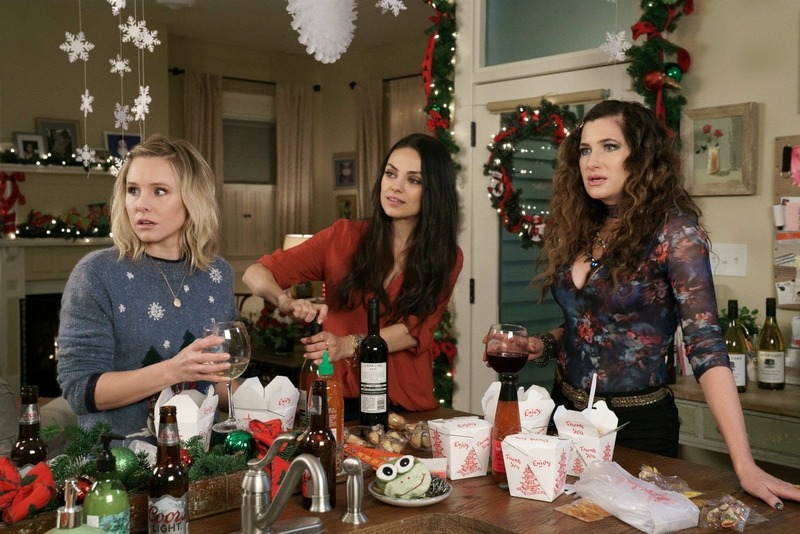 The all-new adventure A Bad Moms Christmas hits theatres this Friday, November 3rd. Last week I, along with a small group of bloggers, had the opportunity to screen the film and sit down with several members of the cast to talk about all things Christmas. 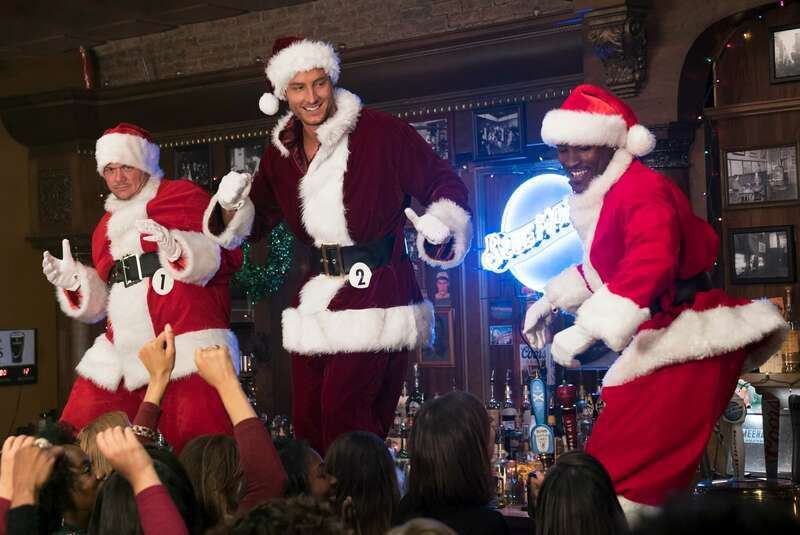 Oh, and we also got the inside scoop on one of the funniest scenes in the movie in which Carla (Kathryn Hahn) waxes Ty (Justin Hartley) to get him prepared for a Santa stripping contest. I’m not sure if I have ever blushed and laughed so much watching a scene in a movie as I did with the Justin Hartley, Kathryn Hahn waxing sequence. It was hilarious! Of course, when we had the opportunity to talk to Kathryn, this was one of the first things we talked about. We asked specifically about this scene and what it was like working with Justin. Kathryn Hahn: There wasn’t enough Justin Hartley takes. I’m left unsatisfied. Well, that was the first time we had met was that scene. So we shook hands, him in a towel, and we kind of got right into it. It was in a practical spa at a lovely hotel in Atlanta where they had only closed off like I guess half of it and the other half was a working spa, so there were people literally walking around with cucumber water in robes just seeing us walk through. But we just got down to business very fast. There was no small talk. We just got right into it, which is the only way to do it with a scene like that. Any sort of small talk it gets real uncomfortable. Kristen Bell: This is what I say to all my friends. Do you know how many times I’m here? Once on Earth, one time. So like I want it to be joyful, and happy and exciting. And a good portion of that joy, and happiness and excitement is my kids, and then every now and again you hit capacity, and you’ve got to switch it up, and you’ve got to take a girls night. And that’s healthy, and that’s actually healthier than not doing it. And for some reason culturally we’ve decided it is unacceptable to talk about mothers being autonomous women at all, ever, point blank period. Self-care, and forgiveness and not feeling ashamed for anything and just being confident in your decisions is a really important part of life that no one talks about. And for me that’s what this movie is about. It is okay to want to go get a massage. It is okay to say to your husband I need seven hours off tonight! Kathryn Hahn: I also think one of the important messages of both movies is just like the lack of judgment and self-criticism, to try to like let that go because, like Kristin was saying, it’s like we only are mommies to these little people for a very short amount of time, and if you don’t want to spend like any excess nonsense worrying about crap, whether it’s what your cupcakes look like, or you know what I mean? Like whose cupcakes are better than… we just spend too much time thinking about other things. Getting out with your friends is something that is really important but that doesn’t mean that moms don’t have guilt about it. I know that I do. It was refreshing to hear that I’m not the only one that feels that way. Mila talked about her guilt and I really related to what she said. Mila Kunis: I do it (go out with friends), but I just say out loud I actually do feel bad about it. Like I’m not going to pretend like I have no problem going out my girlfriends. I absolutely have guilt over it. I have an amazing partner who is like get over it. Get out. So I do have somebody that’s constantly like pushing me to like, you know, be my own human being. That doesn’t stop me from having guilt. I think that sometimes people don’t want to say it out loud, and I have no shame saying it out loud. We were having this conversation earlier. I feel like I’m very vulnerable after I had kids, but all that vulnerability ever did was make me be more confident in voicing it. What is your ideal girls’ night out? When they do get out with their friends, they want to have a great time. We asked the ladies about what their ideal girls’ night out would look like. Kathryn Hahn: I love karaoke so frickin’ much. It is such a release and so stupid, and we’re cheering each other on. So that’s recently what I’ve been really enjoying. But sometimes I’m too tired and that sounds exhausting because you also know you have to have a couple of these before one can sing. So I also love a nice digested meal, where you can take bites, and you’re not inhaling your food… I feel like that is also very relaxing for me, just to taste food. The cast of Bad Mom’s Christmas was amazing. I felt like each of the moms in the movie fit their roles well. The chemistry between everyone was spot on and really seemed like they were their real-life moms. We had to ask who chose their on-screen moms. Kristen Bell: We kind of got to pick. And I think that’s what made this movie really worth it for me. I mean I would’ve done it anyway because I’ll do anything with these girls, but what made it intensely interesting is not just having another situation that we take back, but a situation where we’re taking something back, and we are like thrown like up against a wall because our moms come home, and we are not just overworked moms. We are now rebellious teenagers as well. Again, it is okay to be two things at once. 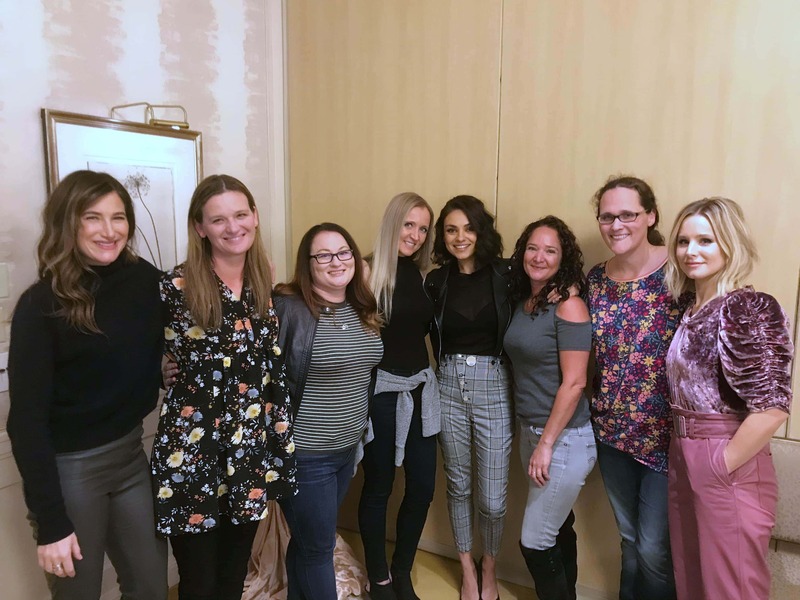 Check back all week as I bring you more coverage from the Bad Mom’s press event and share my personal thoughts about the film!